TUBELiTE Synergy+ is a comprehensive skin care platform that integrates 4 technologies into 1 machine to give a bright & glowing skin. Mode of Action: The spiral eddy movement is combined with vacuum technology. The water molecules directly penetrate to pores and continually make Brownian movement. Unique TUBELiTE Solutions are used in this step. Mode of Action: The particular CapsugemTM tip with specific vibration frequency of handle produces countless CO2 micro bubbles. The minute CO2 bubbles penetrate the skin & rupture to trigger Bohr Effect. Hence, oxygenate skin surface. Mode of Action: Collagen is the building block of the skin and is one of the main keys for skin tightening. The radio frequency evenly heats the collagen up to 37-41°C that helps in collagen remodeling and generation. 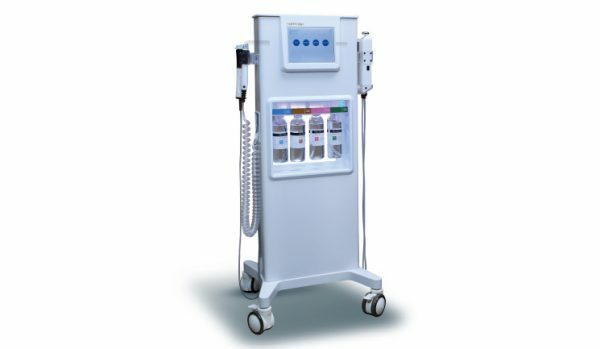 Mode of Action: uCosmo handle delivers 1 MHz high-frequency ultrasound along with products into the skin. It effectively breaks down the molecular structure of active ingredients into more minute molecules. So, they can easily penetrate cuticle barrier of the skin.